If your answer is YES, then Building A Beautiful Marriage is for you. After payment, send an email to thebeautifulbranch@gmail.com or call +2348158867545 to supply details of your location, number of copies paid for and email address you want the eBook sent to. Looking at our world today, it is rather sad what marriages look like. There are so many troubled marriages. Divorce rate is on the increase. Domestic violence is the order of the day. Many wish they never married their spouses. Many people are going through serious issues in their marriages away from the eye of the public. Marriage is a building. The foundation of that building will determine its ability to withstand stress. Yes, there will be stress factors attacking your marital relationship but you can overcome all of them when you allow the All-powerful God who is the author of marriage and the people involved in the marriage to be the head of your home. When God instituted marriage, He had a picture in mind. That picture was a perfectly beautiful one. I tell you, it is possible for you to enjoy the kind of marriage that God desires for you even in the midst of the turmoil that many marriages are going through in this day and age. You don’t have to pretend to be happy in your marriage when you are not. You don’t have to endure your marriage when you can enjoy a beautiful one afterall. You can dream again in case you have given up on your marriage. You can have a peaceful and romantic relationship with your spouse. This book by Dr (Mrs) Mary Omolola OMOSEBI will show you how to transform your dream of having a beautiful marriage into a reality. 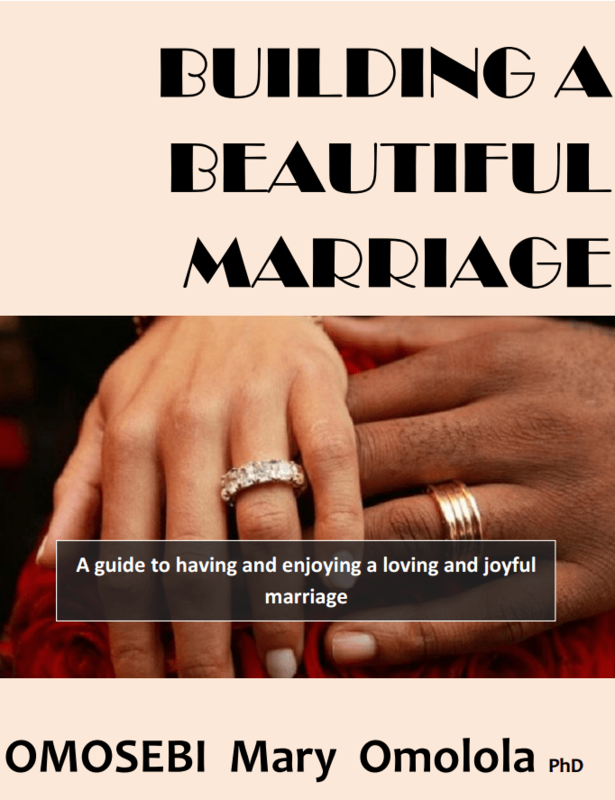 This book addresses topical issues relating to marriage. You will find in it several helpful tips for virtually all aspects of your marriage. Get a copy of this book and embrace the liberating truths therein and experience the birth or reinvigoration of a loving and joyful marriage! Or simply fill out the form on the RESOURCES page especially if you are interested in making bulk purchases as indicated below.